On Monday, President Trump nominated Judge Brett Kavanaugh of the Court of Appeals for the District of Columbia Circuit, to fill the seat vacated by retiring Justice Anthony Kennedy. Both liberal and conservative groups are already engaged in an expensive advertisement battle over Kavanaugh’s nomination. The Associated Press reported that the Judicial Crisis Network is “prepared to spend as much as $10 million” on a pro-Kavanaugh ad campaign, after spending $17 million to block Merrick Garland and support the confirmation of Neil Gorsuch. 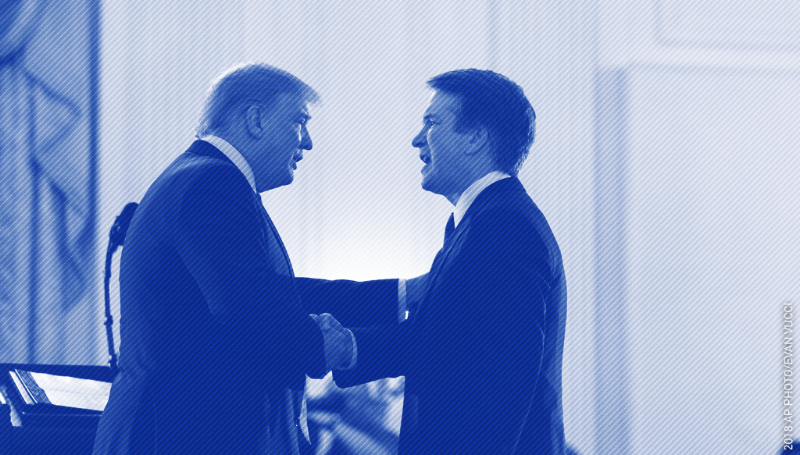 Carrie Severino, chief counsel and policy director of JCN noted, “We will do what it takes.” Other conservative groups also intend to campaign for Kavanaugh, including America First Policies and Americans for Prosperity which have both prepared seven-figure campaigns to support Kavanaugh’s confirmation. Meanwhile, the liberal group Demand Justice has committed to spending $5 million in opposition to Kavanaugh, and according to USA Today, “is already airing ads pressing Collins and Murkowski to oppose Trump’s nominee.” NARAL Pro-Choice America also launched a six-figure ad campaign. The Iowa Supreme Court is currently the only state in the country to have an all-male supreme court – but a woman will be replacing retiring Justice Bruce Zager on the court this fall. Nearly 70 percent of the applicants for the position were women, and after vetting and interviewing candidates, the state judicial nominating committee narrowed the field to three final candidates, all of whom are women. Gov. Kim Reynolds will choose Zager’s successor from the three recommended candidates. According to NBC San Diego, this week was the first time that fast-tracked group hearings for illegal border crossings took place in the federal district court in San Diego. Officials in California had long resisted implementing such a policy. But after the Trump Administration implemented a zero-tolerance prosecution policy for unauthorized border crossings, federal courts in California received “an overwhelming amount of immigration caseloads,” and accordingly, have begun to hold group immigration hearings. While this move “puts California in line with other border states,” critics characterize the change as “assembly line justice” that violates due process. The U.S. Attorney's office defended the change, commenting that the office is "committed to securing the border and enforcing criminal immigration laws in a way that respects due process and the dignity of all involved." Last week, the California Supreme Court unanimously ruled that litigants entitled to court filing fee waivers are also entitled to obtain a court reporter without charge.